Since I have reviewed the past two Eclipse release trains, I’d figure I’d throw in my thoughts for Galileo. In the last Eclipse annual release, Ganymede, there were 23 projects on the train. On the Galileo train, we have grown by 10 projects and are at 33 projects. In terms of enhancements, there are so many new things in Galileo that I’ll only talk about my five favorite things from the various projects. In the end, it was amazing to see how quickly the Cocoa port was developed. I was one of the early adopters helped shape the port by quickly filing bugs with any issue I came across. I have to admit the first month was a bit rough as some of the crashes were very unforgiving, but hey, we’re past that now, right Kevin ;)? From early feedback, most people have been very pleased with the work that the PDE team did. 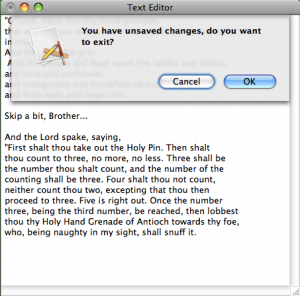 All I can say is that in Eclipse 3.6, look for more improvements in this area. Our goal is to make bundle development as easy as possible for people! 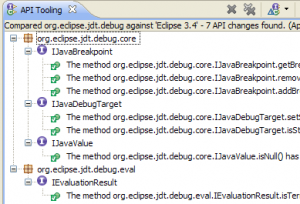 It shouldn’t be a secret, but one of my favorite projects at Eclipse is PDE’s API Tools. The main reason is that once you start building complex applications with OSGi, good version management tools are critical. The main reason for this is that people tend to treat versions as a marketing number and not an indication of contract. The travesty of how we treat version numbers in the software world deserves its own posting, so I’ll save that for later. API Tools helps us crafting the right version number based on the changes in our code. Add a new API method, well that will be a minor version bump for you! Break API? Well that will be a major version bump for you! This basically solves the problem of developing for a certain version of Java and using methods from a newer version of Java. Inside the Eclipse platform project, we’ve had many builds broken due to people doing this so we finally invested in creating the tooling to rectify the situation. You are now easily able to compare a bundle in your workspace with one in your baseline to see what’s changed. You can easily take a gander at what methods, fields and classes were added or removed. 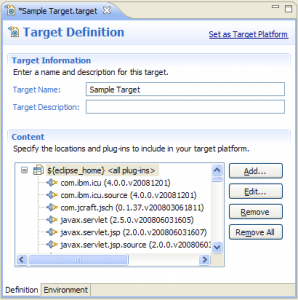 In Eclipse 3.6, look for the PDE API Tools team to further improve the tooling and focus on package level versioning. There is a PHP Package now for the PHP community. It’s quickly becoming one of the more popular packages people download at Eclipse.org based on the stats. 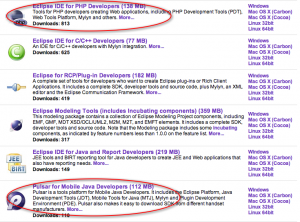 The other new package is Pulsar which was built specifically for the Mobile Java community. Pulsar is essentially a mashup of the Eclipse SDK and the Eclipse MTJ projects with the ability of downloading more tools from different handset manufacturers. I wonder what next year will hold for new packages? 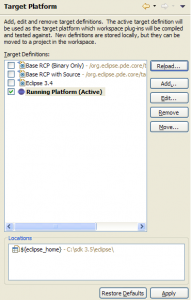 ← Previous PostEclipse/OSGi enthusiasts in D.C.?